7 years! How have SEVEN years already gone by?! It’s pretty surreal, so I wanted to share a bit about how North Jersey Aquatics all began — born from a love of teaching, a love of the water, and a passion to help end childhood drowning. North Jersey Aquatics was founded the month before my daughter was born, in August 2011. As we went through the exciting time of incorporating our business, deciding on a name and logo, and planning what we would offer, so many things went through my head. I vividly remembering driving down the highway on a road trip and my husband saying to me, “Come up with a good name, Leighann, because when this thing becomes huge someday, you will want a household name.” We laughed together and I said, I am just excited to be teaching what I love, I am not expecting big things! Seven years later… I am having a tough time putting in to words the feelings in my heart as we arrive at this anniversary and explode into the future with all of our new programs. 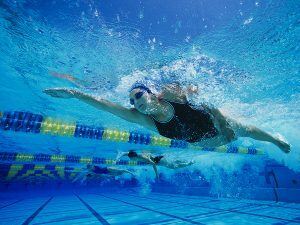 In my past life as a national level swim coach and teacher, my days were filled with 8 hours of teaching, 5 hours of coaching, and a 7-day a week work schedule. The moment I found out I was pregnant, I knew that my life had to change. North Jersey Aquatics was the culmination of many different swim positions in my life, but truly brought together my family and swim life permanently. I had always thought I loved coaching competitive athletes, until that little baby came in to my hands. When she was just a few months old, I went looking for infant swim classes for her, and could not find anything in our area that had what I wanted. Although NJAC began as just national level technique analysis, I realized very quickly in our first few months of being open that I had a passion for teaching the little ones. I saw the statistics: drowning is the leading cause of accidental death for ages 1-4 in the US. This immediately made my head spin, as I realized that all of my friends had babies and kids in this age range. 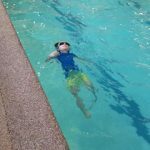 On our very first Learn to Swim day, I taught a parent/child demo class with about 10 other mom friends of mine who had recently had little ones as well. It was a huge hit, and our Learn to Swim program was born! From Winter 2012 when we had 25 swimmers, we have grown to 900-1100 swimmers PER SESSION here in 2018. We have had over 6000 swimmers come through our program since that first day! To this day, I have to say that I still LOVE teaching Parent/Child classes and interacting with all of our new moms! Our first ever parent/child class! Over the last 7 years, so many things have happened! Every single year, we have grown and expanded to more pools in our area. We have added more instructors… and more… and more! Our team now consists of 6 incredible members of our office team along with over 70 instructors, across 9 locations! Just when I think we cannot grow faster… we have an idea for a new program, and we launch it! Just this year alone, we have launched a new Pre-Swim team Program, Clinic Program, High School Clinics, Adult Program, Volunteer program, planned our first charity event, launched our new website, designed and launched our new app, launched our first social media program, moved in to a real office space, and launched our new ambassador program. We cannot wait to see what is next! I look back on our exponential growth and constant change, and know that I have all of our instructors and swim families to thank for so many things. At every staff training, we stress the importance of developing a lifelong love of aquatics, building trust with our families, and providing an experience that will not only ensure our families love their classes, but that we prepare our families to be safer around water every day of the year. Perhaps what I am most proud of looking back and then looking ahead, is that we are truly making a difference in so many lives, both NJAC Team Members and our Swim families. Our families are more aware and safe around water than ever before. More and more of our swimmers are going on to competitive aquatics as they get older, and we could not be more proud of them. So, we hope you’ll raise your googles and join us in a virtual cheers! Cheers to 7 years, and onto the next 7!